For the most part, week nine was a nice one for my fantasy surprises. Colin Kaepernick had a huge game, the Dolphins defense was able to force some turnovers and scored a special teams touchdown, and despite only having one catch Kyle Rudolph recorded a touchdown. This has been an interesting year for fantasy football as it seems there aren’t as many players that are sure things on any given week. Whether if it was due to injuries or circumstances around them, it seems more players than usual who were labeled as guys to draft in the first two rounds will be considered disappointments. Granted, there is still time for them to bounce back, but if a team you weren’t expecting to struggle in your league is that could be a big part of it. QB: Jay Cutler vs Buccaneers: With quarterbacks such as Matthew Stafford and Derek Carr on bye, some fantasy players are going to need to hit the waiver wire to find a quarterback this week. While you never know what you’ll get, the matchup certainly works in Cutler’s favor this week. The Buccaneers secondary has been dreadful, and the Bears at the least have been able to move the ball. Expect around 250 yards and two touchdowns. RB: Darren Sproles vs Falcons: Don’t look now, but Sproles has received nearly twenty touches in each of the Eagles last two games. In a game that could be a shootout, he makes for a very nice play this week. Due to a low price, don’t be surprised if he’s a popular daily fantasy play as well. 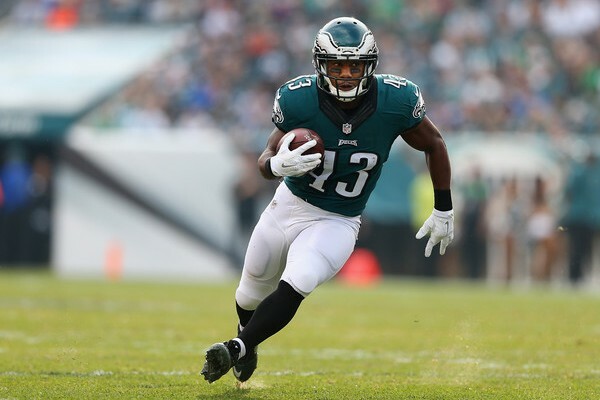 If your league counts points per reception, it will only be more of an added bonus to make sure Sproles is in your lineup. Expect around 100 total yards and a touchdown. WR: Kenny Britt vs Jets: Can you really trust a receiver who has Case Keenum throwing him the ball? For a one week option, Britt does have a lot of upside. Despite plenty of big names on the defensive side of the ball, the Jets are vulnerable in pass coverage and he should see eight to ten passes thrown his way. That isn’t something you can get out of a ton of guys that might be left on waiver wires, so Britt is worth a look. Expect around 60 yards and a touchdown. TE: Cameron Brate vs Bears: I feel like I’ve talked a lot about Brate in recent weeks, but Jameis Winston has no true threats in the passing game other than Mike Evans to throw to. Someone has to get those opportunities and Brate has at least shown some positive signs. While the Bears pass defense isn’t as bad as one might think, they are beatable. For a possible waiver wire option that could get more than a handful of balls thrown his way, there isn’t much more to ask for. Expect around 50 yards and a touchdown. K: Chandler Catanzaro vs 49ers: Due to being affiliated with what was a high powered Cardinals offense last season, Catanzaro was probably a popular pick in fantasy drafts this summer. Unfortunately, the Cardinals haven’t recaptured that magic and Catanzaro’s fantasy appeal slipped as a result. The good news is the Cardinals play a 49ers defense that has been reeling of late. Opportunities shouldn’t be a huge issue in this one. Expect around three extra points and two field goals. DEF: Texans vs Jaguars: Fair or not, most of the Jaguars offenseive woes will be tied to to Blake Bortles’ regression in his third year. There have been a lot of questions as to what could be impacting Bortles’ play but the one thing at this time is you can probably feel safe starting the defense going against him. Considering the matchup, it doesn’t seem like the Texans have been talked up as a top option this week, so I’m placing them in this slot. Expect around four sacks, an interception and a fumble recovery. This entry was posted in fantasy football, NFL, sleepers and tagged 2016 week ten fantasy football predictions, Cameron Brate, Chandler Catanzaro, daily fantasy football advice, Darren Sproles, Fantasy football, Houston Texans, Jay Cutler, Kenny Britt, NFL. Bookmark the permalink. Nice! I’m a big fan of Cutler vs the Bucs. Go check out and follow my blog for updates on all things sports!